Two-sentence summary: After his sister runs away, bullied teenager Matt develops an eating disorder in the hopes that starvation will make him stronger and bring his sister back. As Matt bonds with and develops feelings for his sister’s friend (and possible former fling) Tariq, he discovers that some things—good and bad—cannot be controlled by force of will. What I loved: Until now, I hadn’t read a YA novel about men and eating disorders. I’m glad the first one I read was this one. Books about eating disorders tend to follow a pattern: they’re usually firmly planted in the realism category and don’t contain much humor. Which is valid and respectable, but The Art of Starving borders that line between fantasy and reality and it has an authentic, somewhat bleak sense of humor. It still gives its tougher subjects much-needed respect but isn’t afraid to take a book about mental health into unexplored directions. And, y’know, the humor is a little refreshing. Relationships play a heavy part in shaping this story, the strongest of which are Matt’s confusion and longing towards his sister and his tentative romance with caring, yet cautious Tariq. In addition to these, Matt also struggles to understand his mother, who bonds with others mainly through food in a way that triggers his eating disorder. And then, of course, there’s the relationship that Matt has with himself—beneath all the self-loathing is a potential that he himself sees but must learn to access in a healthy way. This book hits its strongest stride when Matt works through all of these tangled relationships to see himself and those he loves a little clearer. 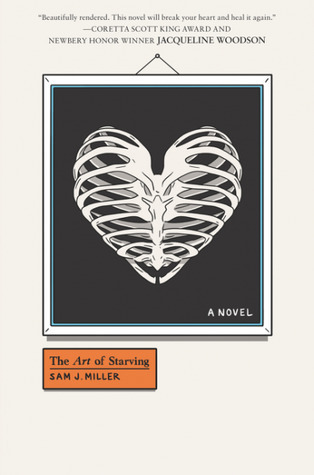 Recommended: If you want a YA book about anorexia that breaks the norms, this is your book. Not only does it feature a male protagonist with an eating disorder (in itself pretty rare), but it also features some speculative fiction elements. The way Miller uses fantasy to write truths in a way that reality can’t always do justice is both sad and beautiful. Its ending is also hopeful enough that the novel can explore some tough, dark topics while still letting some light shine through.